When I was a kid word got out that I loved Zereshk Polow. When information as such gets out all of a sudden it seems as though that’s the one dish that people keep on making for you. As such, I have had plenty of it in my life time. PLENTY! 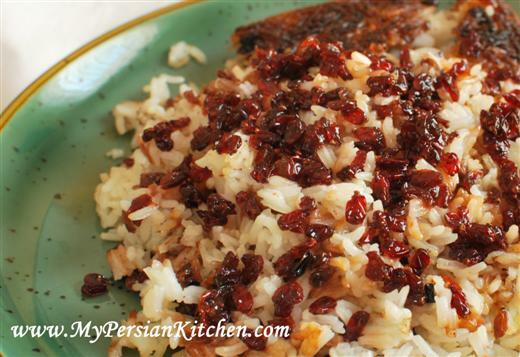 As an adult I still love it as I love zereshk, barberries, and also because it is such a simple polow to make. Of course, let us not forget that I love all things sour and barberries are indeed sour by nature. 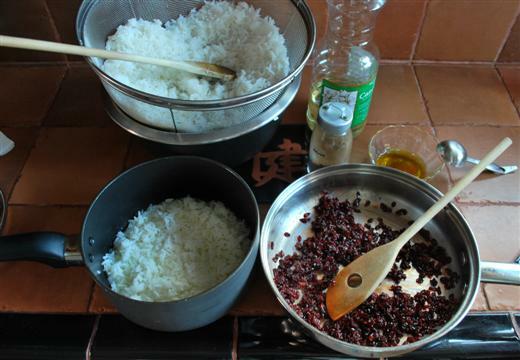 There are a couple of different ways to make Zereshk Polow. Some folks layer the rice with zereshk and steam them together while others simply make a chelow and add the zereshk on top. Personally, I am a fan of the first method as I think that the polow as a whole tastes better. With this said the zereshk changes color in the steaming process and goes from a gorgeous bright ruby red color to a dull brownish color. So at some point I came up with an idea where I hold on to a little bit of the zereshk and sprinkle it on top of the rice when it’s time to serve it. 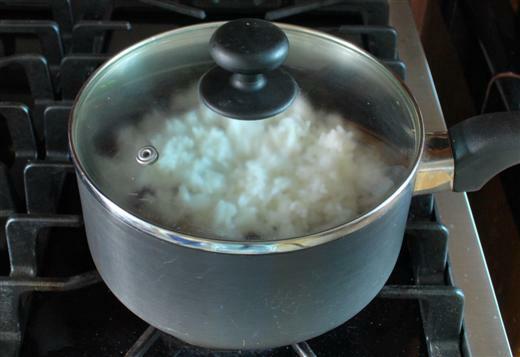 First cook rice per Cooking Rice for Polow post. In the mean time prep the zereshk. Pick over the zereshk and remove any steams or stones you may find. Then soak in water for about 5-10 minutes. I find the best way to do this is by placing the zereshk in a colander and submerging it in a bowl full of water. 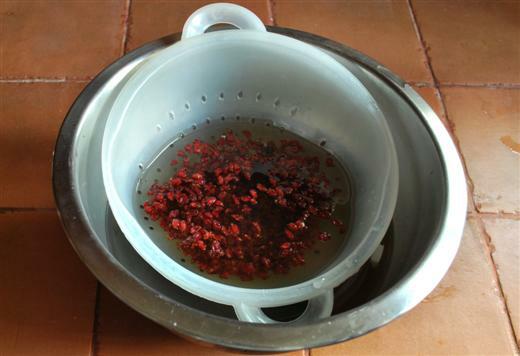 Rinse zereshk after soaking. In a skillet melt 1 tablespoon of butter then add zereshk. Add sugar and give it a nice stir so that the zereshk is coated with butter and sugar. You will see that it will start to plump up! Add 2 tablespoon saffron water and let the zereshk absorb the liquid for about one minute. Turn off heat. Begin layering rice. 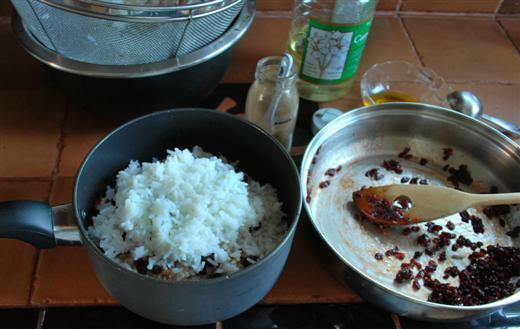 Prep tahdig in any method you prefer. This time I used canola oil, water and 1 tablespoon saffron water. Place one layer of rice. Sprinkle about 1/4 tsp of advieh. Top with some of the zereshk. Repeat layers until the last layer is rice reserving about 1/4 of a cup of zereshk for later. 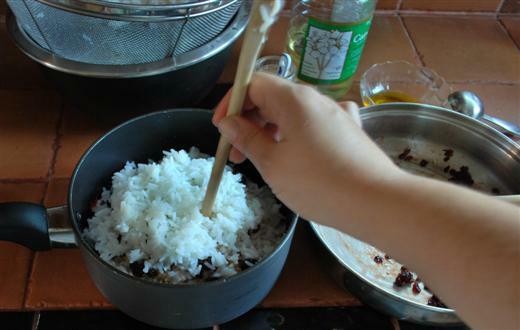 Create 4-5 holes in the rice with the back of your spatula. 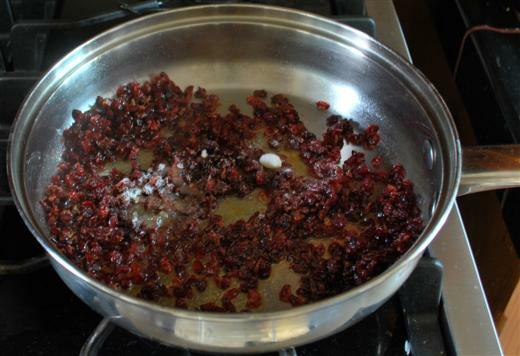 Melt 1 tbsp of butter and mix with 1 tablespoon of Saffron water and 1 tablespoon of water. Pour all over rice. 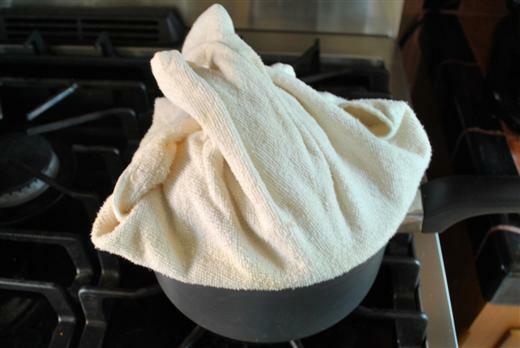 Place a kitchen towel over the lid of your pot and steam rice on low for one hour. Serve rice in a platter and top with the reserved zereshk. Generally, Zereshk Polow is served with chicken. You can either add some cooked chicken as you layer the rice or simply serve it on the side. I think that Mitra’s Sunshine Chicken goes really well with this rice. Alternative, I will be posting another chicken recipe on Wednesday. Here is a funny video for you all to watch which shows Persian comedian K-von‘s take on making Zereshk Polow. 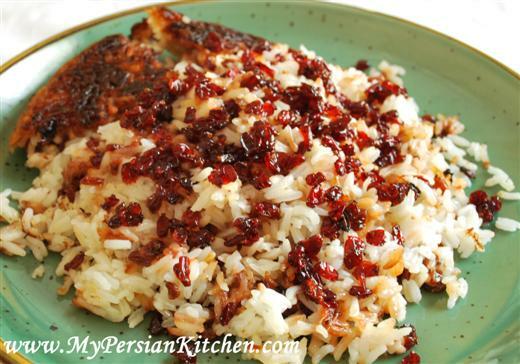 Gentlemen, should you wish to impress women with your fine Persian cooking skills, please, I beg you, make sure that your polow does not come out like K-von’s lop sides master piece! You can fast forward to 5:15 to see it. And while we are at it, no spinach or carrots either please! Sabzi, on the other hand, Yes! * Vegans, use vegan butter. Congratulations (belated) for your first anniversary. I am glad you keep posting good looking recipes. I just found out that there is a new Persian restaurant in my area, maybe I will try it soon and then will let you know how it was. Mely!! So good to hear from you! I always check in to see if you have posted new recipes. I have made your salsa verde over and over and it is such a favorite! Congrats again on first anniversary. i don’t do the layers. i make the rice and zereshk separately . When rice it ready i mix them together in the serving dish. i will try your way this time. 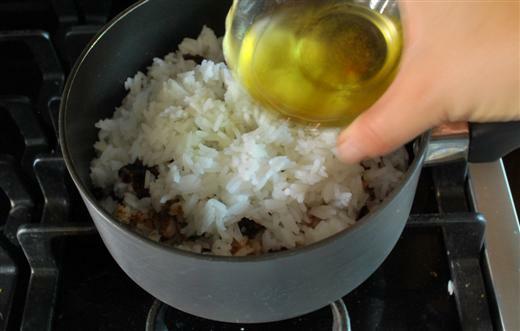 I have never seen anyone make zereshk polow that way…so there is a third way…good to know! Interesting how there are so many ways to make the same delicious dish. I like your technique, and will try it. Agreed! Especially because it is the simplest type of polow to make. I don’t think you can ever go wrong with lemon zest! Congrats on the blog’s b-day. Zereshk polo looks mighty good! Tadig looks hidden but delish too. My mother in law makes the most beautiful and delicious Zeresht on this planet….its her twist on it of course…it includes pistachio and almond slivers with the sweetened barberries and she mixes it with the rice but with saffron rice and a touch of white rice….so on the plate it looks like a Persian Masterpiece…and I am not joking !!! next time she makes it I will take a picture and post it..its too amazing to explain with words !!! Kris, sounds delicious! Please do take a picture and share! What could u serve this dish with? Kate, this rice is usually served with chicken, which can either be placed in the rice layers or simply served on the side. Salam alaikum, This is delicious rice! I adore the barberries in this, my first time trying them!! 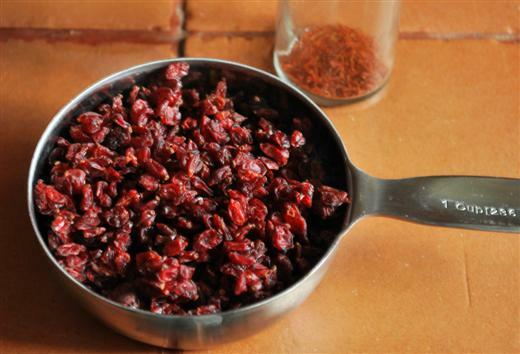 I have made this twice now and we prefer to add some more sugar to the barberries when I serve it with your tasty Sunshine Chicken. I would like to make this again insha Allah. I just wanted to tell you, THANK YOU!!!! I just made this rice for the first time, but not for the last. OMG, it’s sooo very very yummy. I could eat this almost as dessert. I adore the barberries! I also love your Sunshine chicken, although I made it with chicken kabobs…totally delicious dinner, thanks to you! Just wanted to thank you so much! 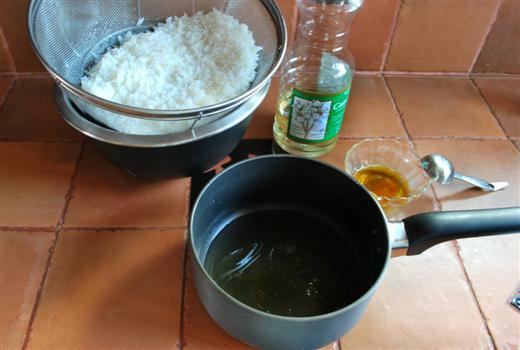 How do you change the instructions for the cooking method if you are using a rice cooker (traditional Asian one)? 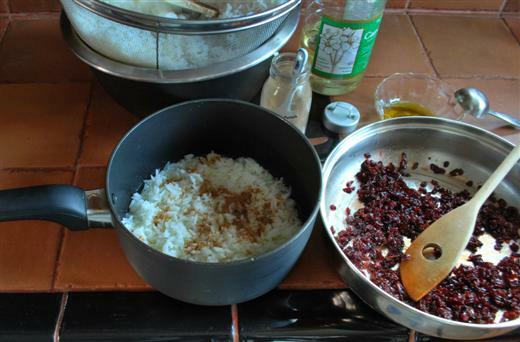 Katherine, I would load everything in the rice cooker and just when the water is almost absorbed I’d stir the rice so that the barberries don’t just sit on top of the rice. I’m making this tonight. I’m new to Persian cuisine and I’m excited to learn more about it. My friend sent me some barberries, so this will be my first adventure with them! Thanks for the clear instructions. I’m a little confused as to how much oil and water I’m supposed to use for the tahdig. Can you provide an example? Thanks! Rosanna, you should use about 2-3 tablespoons of canola oil and a thin layer of water. I absolutely love your recipes. Thank you for letting me bring delicious Persian food into my home without needing to get takeout! Hi everyone, I am new here and live in England. When i make tahdig i use butter not oil. Is that wrong? I would be grateful for all comments. Liliana, no, you are not wrong. There are different ways to make tahdig. Each person has their own preference.